Recently I stopped off in Perivale Park, just off the A40 near the Hoover Building, which I wrote about a couple of years ago (http://diaryofatouristguide.blogspot.com/2017/05/hoover-from-factory-to-flats.html). 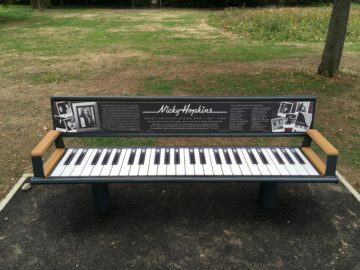 It is a park bench in the shape of a piano and remembers Nicky Hopkins, who is the most famous distinguished musician produced by the UK, in fact probably the only one lots of casual music fans like myself have heard of. Probably his most famous playing can be heard accompanying Mick Jagger’s singing on the Rolling Stones’ single Angie. Hopkins was much in demand in the 1960s and 70 and played for the Beatles on Revolver and the Stones on Beggar’s Banquet. 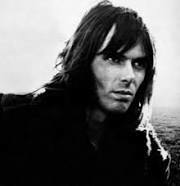 Neither band, nor others that he played for, like the Kinks and the Who, had a regular keyboard player (although Paul McCartney was – and is – a competent pianist) so Hopkins filled in as a session musician. 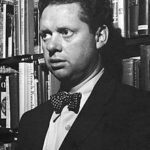 He suffered from Crohn’s disease, which made touring difficult and led to his early death in 1944 at the age of fifty. Having heard about this new memorial on the radio I stopped off there on the way back from a weekend with my children in Bristol and had a look. I walked through the park and asked a couple of local ladies, who knew what I was talking about, and directed me where to go. 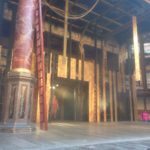 When I arrived at the bench I found another local, a middle-aged man, who was sitting there and told me that about a hundred people had been there for the unveiling the day before. He directed me to the back of the bench where the names of many of those who had contributed to the crowdfunding were displayed. This had been organised by Hopkins fan John Wood. 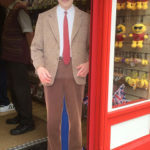 I wondered afterwards if it was Wood I had been chatting to but never thought to ask. He certainly knew a bit about Hopkins, who was the go to guy if you wanted a creative piano player. Perivale is hardly a major stop on the tourist trail but, you never know, as a tour guide I may be asked to take an aging rock fan around some of the monuments and memorials to major musicians. The Hopkins memorial in the north west of London might just be a useful thing to know about one of these days. 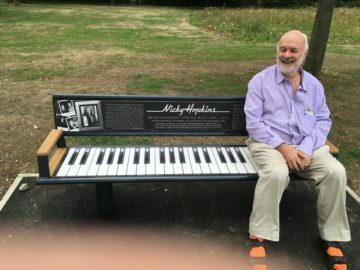 It is certainly the only park bench made to look like a piano that I have ever seen.